As I write this post the sun is shining, the birds are singing and the daffodils on my coffee table are in full bloom, oh yes Spring is finally Springing- which naturally means I need to make a few new additions to my wardrobe, makeup bag and last but not least home decor! Having been a student for the past three years I'm not used to having such a nice grown up flat to fill so last week I popped along to Primark to get some pretty homeware pieces that would swing my flat into Spring. The main thing that needed updating was the reindeer blanket I had over my sofa, so I picked up this super cute floral throw that also happens to be super cosy (we all know snow can still happen in Spring!). I literally love the pattern and colours and it makes a very good blog background too, all for only a tenner! I've been on a bit of a mission to create my perfect girly room this year too which is going well with my rose covered duvet and shabby chic bunting, but I'm always on the lookout for extra touches that don't break the bank. 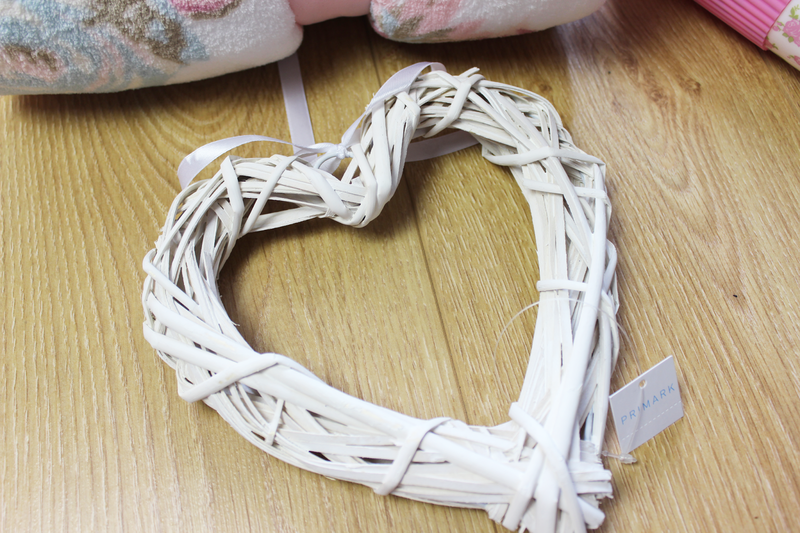 So you can imagine I went a little bit crazy when I saw a basket of white wooden hearts for only £1 each. I could have bought the lot but restrained myself to getting just two and these are now hanging from my bedroom mirror and walls to continue the vintage shabby chic look I've got going on. Another outdated thing I had a lot of were Christmassy mugs so it was certainly time to introduce more seasonally relevant drinking devices. 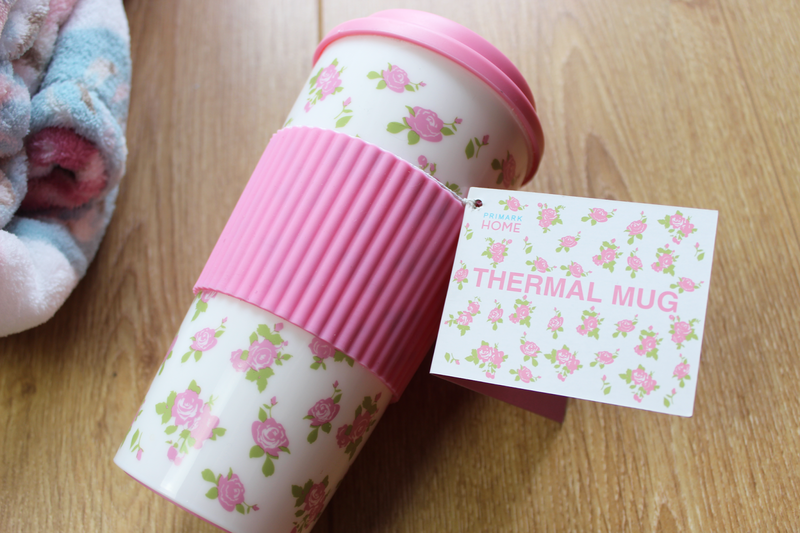 This meant I was very happy to find this pink and flowery thermal mug for just £2.50 as it not only makes drinking hot tea on the go a dream but also looks ever so pretty on my bedside table. 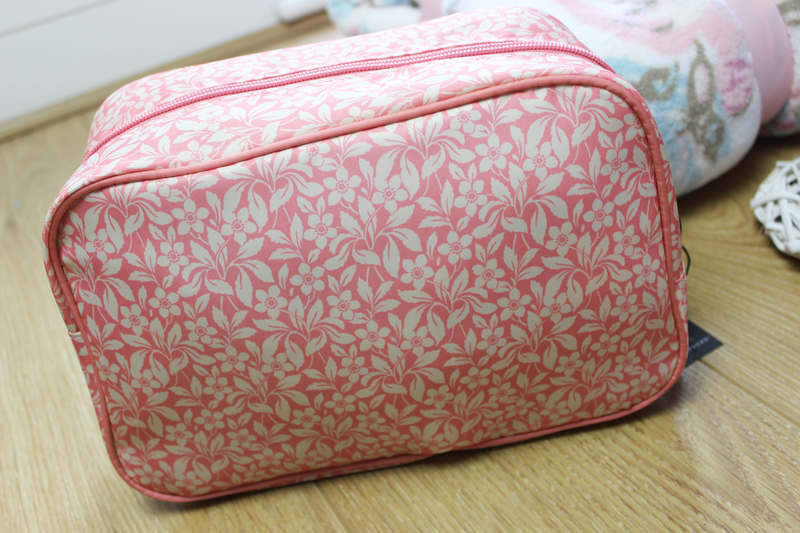 Last but not least I picked up a pastel printed cosmetic bag as I'm always looking for nice ways to store spare makeup and this is also a good size for travelling, which at £4 a pop you can't go wrong. 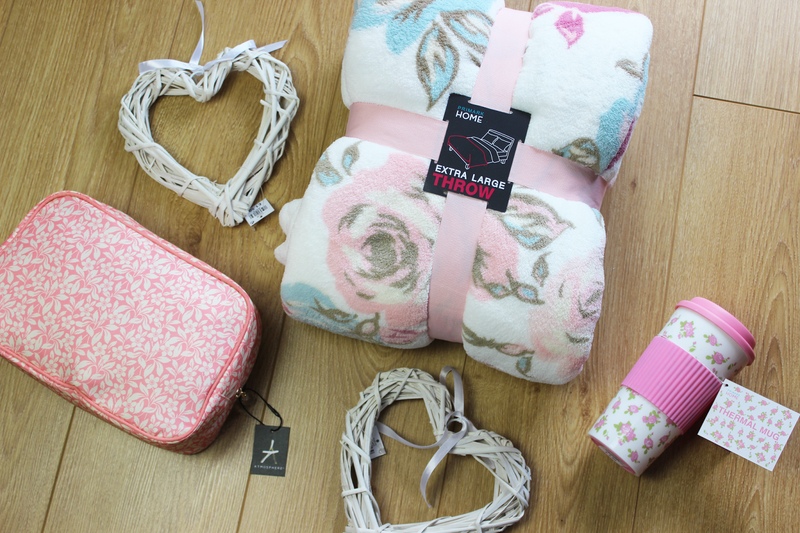 Are you a fan of Primark homeware? Holy MOLY! I need to get to Primark! Thanks for sharing! 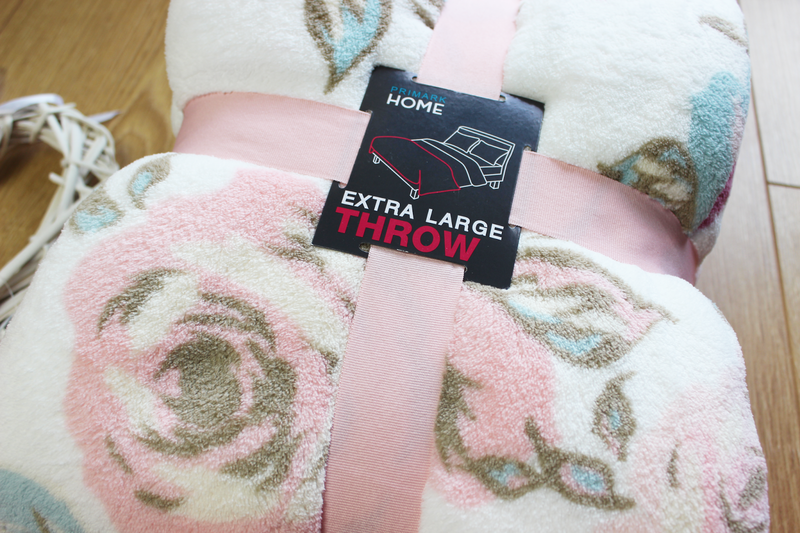 I absolutely love the Primark throws, so soft and cosy! And love the floral version, looks like I'll be spending my student loan in Primark! I love the wooden hearts and have some round my home too, all such pretty finds! I love the floral throw. I rarely shop at Primark but, by the looks of this, I really need to take a look at their homeware section! I love the Primark homewear! It's so cute, they've stepped up their game lately :) That make up bag is amazing too. I got that wash bag earlier, it's such a good size for travelling! I love Primark home stuff it's amazing like they have these really cute rose flower lights in at the moment that I need in my life! i love this bed throw ...i think i need to vistit primark very soon !! I want this mug, how can i buy it? I'm from turkey, and i can't find it in primark official shop.